Moscow State University student Varvara Karaulova, who was caught at the border between Turkey and Syria this spring, has been arrested and charged with terrorism for attempting to join the Islamic State terrorist group, with suspicions that she may have been acting as a recruiter. RBTH spoke with Karaulova’s father and classmates to try and understand what led her astray. The story of Moscow State University student Varvara Karaulova, who left home in an attempt to join the Islamic State (ISIS) radical militant group this summer and was caught at the Turkish border, has returned to the Russian headlines following her arrest and the opening of terrorism charges against her. A criminal case over the preparation for taking part in a terrorist organization (punishable by up to 15 years in prison) was opened against the 19-year-old woman following her arrest in late October, and on Nov. 10 she was charged with terrorism for attempting to join ISIS. According to media reports, the reason was the discovery of Karaulova's correspondence with an ISIS militant, with whom she had allegedly fallen in love, and the suspicion that she might be a recruiter. 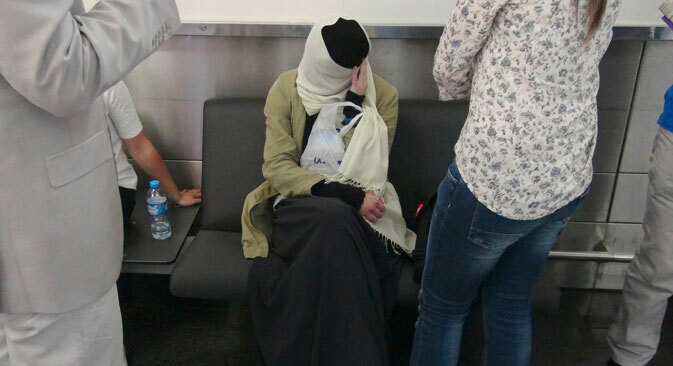 Back in July 2015, after Karaulova had already returned to Russia, investigators said they had no case against her, questioned her as a witness, but did not detain her, arresting instead two Russians who had accompanied her on her attempt to join ISIS. Following the scandal, the student took a sabbatical and started a rehabilitation program. The incident caused widespread disbelief among the Russian public at the time – how could a straight-A student from a well-to-do family and an intellectual fluent in five languages become the victim of Islamist recruiters? Nonetheless, it appeared that the story had died down – until Karaulova’s arrest on Oct. 28. Karaulova is one of those commonly referred to as a "gifted child." She has won national competitions, graduated from high school with honors and entered the Faculty of Philosophy's Department of Cultural Studies with ease. Boys, fashionable clothing, cosmetics – none of this was for her. "She always went around like this – a free skirt, a T-shirt, modest clothes. When someone courted her, she would say, 'He likes me, but I don't like him. So what's next?’" a classmate and close friend of Karaulova told RBTH, on condition of anonymity. At school, Karaulova was comfortable with her peers, but this did not work with classmates at university; in her first year of studies, she described them as "idiots" and was something of a loner. According to her classmates, hardly anyone knew what was going on in her life. "She was always closed and detached," said one of her peers (who also requested for her name not to be disclosed). While students at Moscow State University are very reluctant to speak about Karaulova, the incident has also shocked the lecturers, who are now concerned about the reputation of the department and advise students to minimize contact with journalists. The lecturers knew no more about Karaulova than those who studied with her. According to the Faculty of Philosophy's deputy dean for research, Alexei Kozyrev, who gave lectures to her group in the first year, she did not stand out compared to other students. "A quiet, neat girl, and, in general, she studied well. I did not notice any signs of her fascination with Islam, I think they did not exist at all," he told RBTH. These signs appeared in September 2015, when Karaulova began to attend a special course in Arabic and came to classes in a headscarf, in which some discerned the hijab. But an interest in Arabic or a scarf or even hijab is no surprise for anybody at the faculty, where there are many people of different faiths. Shortly before fleeing to Syria, Karaulova changed her online messenger user name to Amina (this was the name of the Prophet Muhammad's mother). The only signal that something was amiss, this minor event unsurprisingly failed to attract attention. On May 27, Karaulova vanished, leaving behind a ring engraved with the words "Save and protect" (they say she did not take it off before) and an Orthodox cross. Karaulova was returned to Russia almost immediately: Her father Pavel Karaulov had good connections in the FSB and the Russian Foreign Ministry. "She has a very broad vision, and the ability to learn languages has enabled her to explore primary sources, including in Arabic," said Karaulov in an interview with RBTH. That is why the appearance of the Koran in the house and her interest in Islam was not immediately noticed. In addition, alongside Islam she studied other religions. When Karaulova disappeared, "connections" helped – the trace led to Turkey. "When I was traveling there, one of the versions I had was that she was going on holiday to Turkey, in order to plunge into the range of interests of the Islamic world," said her father. "This was the only boy, she has never had any other. And only virtual communication. It is almost obvious for us now that this person is a synthetic image, and its creation involved several people." However, RBTH managed to learn from her classmates that, in reality, Karaulova did have a boyfriend; they attended a special course in Arabic together "until she dumped him." After her failed escape, according to her father, Karaulova said, "Please, just take away everything from me. If necessary, I will ask." No one in the family knew that Karaulova was continuing to correspond with her ISIS lover, her parents say. Her father sees the arrest as a "tragic mistake." Based on his experience, the student's former lawyer, Alexander Karabanov (Karaulova refused his services on Nov. 10, the day that the charges were pressed – RBTH), admits that the young woman was probably the best candidate for the dissemination of ISIS ideas among similarly well-educated young people. Throughout this time, Karaulova was in the sights of the security services, he said. Why did all this happen to Karaulova? Her classmate believes that it was a revolt, a late adolescent crisis. When she was 15, Karaulova had neither parties with alcohol or clubs or overnight stays with friends. Studies, sports, constant preparation (always followed by success) plus loneliness – that is all that she had. According to her father, Karaulova fell victim to the recruiters because of her "crazy kindness" and softness. After getting into university, she asked for a gift, but it was not jewelry, electronic gadgets or a car that she had her heart set upon. "You know what she asked for? To take a puppy from a shelter," said her father. "<...> Such a person as she cannot help but respond to the pain of others, children, the elderly and animals. This is what they play on, very skilfully," he said. But for Deputy Dean Kozyrev, the most difficult thing to understand is how Karaulova could have failed to see the terrifying footage of Islamic executions on the internet, in which ISIS militants are seen decapitating captured hostages. "I think she must have seen this,” he said. “But then to cooperate with such people?"